Mazda is very bullish about the all-new Mazda6. It claims that the new 6 is set to become the new benchmark in the large family car segment and it’s on sale now in Ireland, writes Padraic Deane. 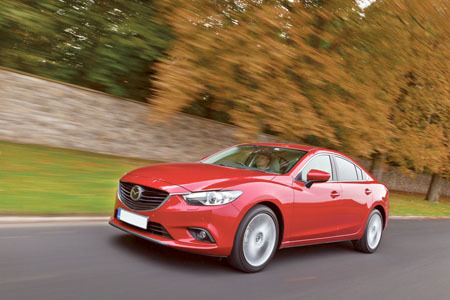 With an entry-level price from €28,745 ex-works, Mazda’s flagship model is available in saloon or tourer (estate ) body styles. And the expected big selling Diesel Sport Saloon starts at €31,795. It certainly has a more premium feeling and is better equipped. And thanks to their SkyActiv development work, the new Mazda6 is more efficient and better drivability than the previous model. With all this positivity on board, Mazda is expecting a brand renaissance, with the new 6 not only retaining current customers but attracting a new profile of customer to the brand. The top chefs know that people eat with our eyes first and foremost. If the food dowse not look good and is not well presented on the plate, then the chances of going on to an enjoyable and successful culinary experience are greatly reduced. No worries on that score with Mazda designers have certainly wetted the appetite with a completely new and stylish exterior design. In fact, the new Mazda6 is the latest evolution of “Kodo - Soul of Motion”, a design theme inspired by the movements of animals in the wild. Whatever is behind the design and styling, it certainly works and there are some new body colours to highlight the package. The interior too is appealing. It is specifically designed with a driver orientated cockpit. The soft touch surfaces, premium quality finishes and satin-chrome detailing create the expectation of something special. And this is where the next step is essential - is there substance behind those good looks? That's where Mazda says that their innovate new SkyActiv comes in. Their ethos behind this is to deliver best-in-class fuel economy and lower emissions without compromising driving performance. The SkyActiv Diesel engine will underpin the success of the car in Ireland. All diesel engines come with i-Eloop; Mazda’s clever new regenerative braking system turning stored kinetic energy into electricity to power the vehicle’s electrical systems. Combined with Mazda’s i-Stop technology, i-Eloop delivers fuel economy improvement of about 10 per cent. The 2.2-litre diesel with the six-speed manual gearbox is expected to be the big seller with an impressive 20 per cent improvement on efficiency delivering 108 g/km of CO2 and fuel economy of 4.2 l/100km (67 mpg ). Performance is not sacrificed thanks to 150 bhp of power and 380Nm of torque. Buyers have can also opt for the six-speed diesel automatic, with CO2 emissions from 127 g/km. Chassis and body structures of the new Mazda6 are stiffer, benefiting from greater proportions of high and ultra-high tensile steels. The steering and suspension combine low-speed agility with high-speed stability and responsiveness to driver input - at a level of precision unparalleled in the CD-segment. In addition to being more refined and aerodynamic, the new Mazda6 will also up at the top of the segment in terms of safety, with standard features on the diesel models including smart city brake support (SCBS ), hill hold assist (HHA ), and dynamic stability control (DSC ). The Sport model in both the saloon and tourer models will be the core seller in Ireland with very generous levels of standard equipment including: 17” alloy wheels, 5.8” touch screen multimedia audio system, climate control, cruise control and Bluetooth, front and rear parking sensors and SCBS. Check out the new Mazda6 if you are in the market for a new car in this class. It deserves to be on your shortlist! Page generated in 0.1130 seconds.